A leading pro-Israel activist within Labour is facing calls for her expulsion from the UK’s main opposition party. 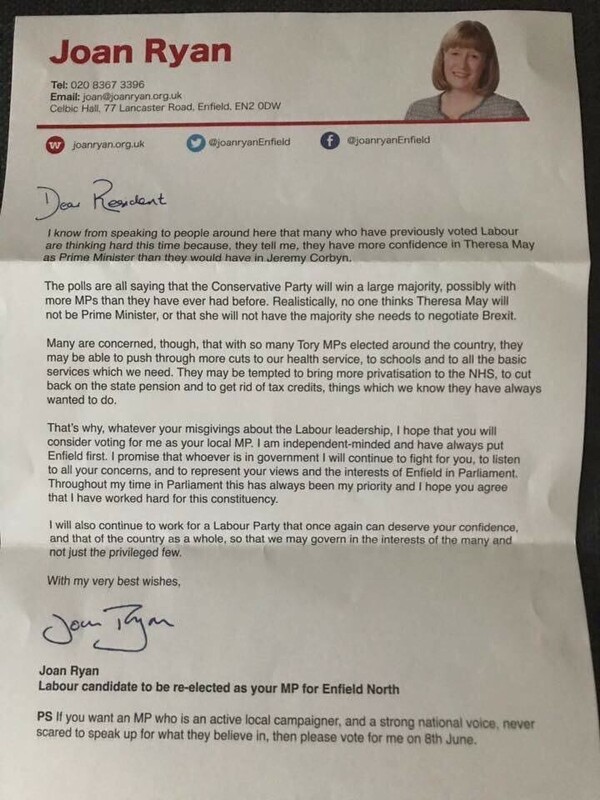 In a formal complaint, Labour members in the Enfield area of North London have called for their local lawmaker Joan Ryan to be disciplined for her “disloyal” general election campaign. As a candidate, Ryan had sought to distance herself from Labour, omitting the party’s logo from her election literature. She was also dismissive of Jeremy Corbyn, the Labour leader. The complaint was made in June to the executive committee of the Labour branch in the Enfield North electoral district. It is part of a push for party democracy since the June election. Members have been increasingly calling for a greater say in the selection of Labour candidates for Parliament. Last month, the executive committee of Labour in Enfield North appointed a delegate to represent that branch during the party’s annual national conference. The appointment was made without rank-and-file Labour members in the area voting. Ryan chairs Labour Friends of Israel, a pressure group within the party. She has long been a vocal opponent of Corbyn, a veteran supporter of the Palestine solidarity movement. Despite “your misgivings about the Labour leadership,” Ryan wrote, “I hope that you will consider voting for me as your local MP [member of Parliament].” She boasted of her “independent-minded” record, saying she would “continue to work” for a changed Labour Party – implying that she would keep on trying to remove Corbyn. This letter formed the basis of the complaint by local Corbyn-supporting activists. Their complaint does not mention Ryan’s history of support for Israel. Despite undermining her own party, the support of grassroots activists and a nationwide surge in support for Corbyn meant that Ryan actually increased her majority in the election. Some of these grassroots activists were local, while others came from surrounding areas, having been advised by an online campaign tool that Ryan’s seat was in danger of being lost to the ruling Conservative Party, due to her small majority. The tool was provided by Momentum, a group set up after Corbyn became party leader in 2015, to capitalize on the popular movement supporting him. While some Labour politicians previously hostile to Corbyn have backed him since he performed far better than expected in the election, Ryan has continued to oppose his leadership. The 24 local Labour members signing the complaint write that Ryan’s appeal to local voters was an “entirely disloyal letter.” Others are expected to sign onto the complaint. Ryan’s election letter disavowed the party, “choosing to omit the Labour Party logo” and dissociated herself “from the party leadership,” the complaint says. Dated the day before the 8 June general election, the complaint concedes that any “suspension of a candidate … will now take place after” polling day. The complaint criticizes Ryan for apparently placing her letter “into the public domain” from which it “rapidly migrated to the national media where it was widely exploited” in an attempt to damage Corbyn. The complaint includes a full image of Ryan’s letter, as well as some of the headlines it generated. Local party members declined to comment on the record, hoping that the complaint would be taken seriously by party management. A documentary by Al Jazeera broadcast in January proved Ryan had fabricated an accusation of anti-Semitism against a Palestine solidarity campaigner who had challenged her on Israel’s settlement activities in the occupied West Bank. All of Israel’s settlements are illegal under international law. Ryan accused the campaigner of invoking “classic anti-Semitic tropes” about Jews in banking – but the video evidence proves that the activist did no such thing. Soon after the incident – which took place during a Labour conference in September last year – Ryan alleged that her Labour Friends of Israel stall had been the victim of anti-Semitic attacks. She also went to the press with this claim. It's well past time that people who work against the general party manifesto and use Israel in particular to further damage the reputation of our party are dismissed and Barred for life. It is only when examples are being set that we will see an end to certain representatives of our party using lies to further their career. She's not just a cuckoo in the nest. She's a hostile cuckoo bent on smearing the nest with her own excrement. Sorry if I use coarse language in this instance, but lives have been wrecked in the Labour Party by such people. Thousands were barred from voting in the second (and unnecessary) leadership contest, simply because they had joined Labour to support a new direction. Other leading figures have been suspended and silenced. Ryan has defamed activists and been shown to have allied herself with Apartheid Israel. There's ample reason to hold her now to account for this behaviour. But I do think the local constituency members bringing this complaint are wise to leave out the Zionist aspect of her misconduct, and to restrict their bill of particulars to her brazen refusal to align herself with the Labour Party during the recent general election. And by the way, it's one thing not to sing the leader's praises on the campaign trail. Some took this route regarding Tony Blair when it became clear that he was responsible for serious crimes and a rightward lurch in policy. But to publicly spurn the leadership and refuse even to employ the party's identifying iconography in your campaign literature, while receiving the financial and organisational backing of that party, raises legitimate questions. Let's hope this matter is properly addressed as more constituency members join the call for action. Ms Ryan's subversive activity in the Labour Party. I watched with utter contempt and disgust the actions of Ms Ryan and her fellow Zionist activists within the Labour Party who tried, and continue to try, to subversively bring down Jeremy Corbyn with falsehoods and lies about antisemitism within the Party. There ploy has been to issue statements which enable the biased Tory controlled right-wing Press to mock and denigrate both the Labour Party, it's members and it's democratically elected leader, Jeremy Corbyn. These people are little more than treacherous snakes in the grass, whose secret agenda and ambition is to keep a right-wing Tory Government in power. Standing for election as a Labour Candidate and being duly elected as such, gave these argeant provocatuers the power to control and destroy the Labour Party from within. These people are nothing less than traitors to Labour Party, it's members, leadership, hopes and aspirations for a better future and a more equal society. They need to be exposed for what they are, and who they are, deselected from their seat and expelled from the Labour Party forthwith. So, amongst the fraternal support for all the critics of Ms Ryan, which, by the way, is well spoken and must be supported, we find the usual, apparently obsequious absence of any criticism of Zionism. Zionism as a political movement has categorically and absolutely no connection with Judaism or "jewishness" or the jewish culture in any way! Have the supporters of Ryan no shame.....Is it not bad enough that she opposes the most successful leader the Labour Party has ever had: she traduces a labour supporter simply seeking to clarify Labour's apparent support for Israeli expansionism! Have they not heard of Ayelet Shaked Israeli MP.....quote "kill the mothers to stop other little snakes being born"....referring to the Palestinians; or the massacres of Shabra and Shatila, overseen by the fascism of Sharon! Examine your principles Labour voters of Enfield! Excellent news! Calling someone an 'anti-semite' or a 'racist' without due cause can be seriously damaging. Its a verbal hate crime of the worst kind. Its about time we treat it with the seriousness it deserves and prosecute deliberate offenders. The question must surely be why she is even a member of the Labour Party. She is not aligning herself with widely held views by the party and supporting apartheid is wrong by any member of any party. You cannot represent a party and distance yourself from them, unless you stand as an independent. This person did neither, and by bad mouthing JC she was bad mouthing the entire LP. What is truly sickening here, with her and the Israel lobby, is that they use the name so that they can shour anti-semitic when anyone is critical of the actions and motives. Anto-semitic and anti-Zionism are chalk and cheese, but this vile lobby, corrupting UK MP's, uses the name to establish a gagging order and a membership expulsion agaenda. We are not Palestinians, much as I support them, and we will not be expelled from thr system of democracy and free speech to satisty a fascist child murdering regime. Anyone founnd working against the aims of the LP, who are working for the UK ppeople, be they internal or external, it is they who will be expelled, from the LP and the Country. How come the Zionist Lobby can have this degree of influence withinin the Labour Party - let alone getting away with it ? Joan Ryan, apart from being disloyal to Corbyn and the Labour Party, was also proven by the Al Jazeera documentary, together with the Jeremy Newmark and Ella Rose who head the Jewish Labour Movement, to be in cahoots with the Israeli Embassy in receiving funds to undermine and 'bring down' MPs who were critical of Israel, and also 'take down' Jewish Labour, activists with spurious accusations of antisemitism. All of them, Ryan and the JLM have vowed to continue their campaign to discredit the party , completely falsely, as being institutionally antisemitic,to continue to push for expulsion of members who they see as supportive of the Palestinian cause, and to carry these aims through the Labour Party conference. These are all destabilising factors for Labour, which pursue an agenda of a foreign country, which has a highly supportive lobby in the government, and all the 'Friends of Israel' groups within Parliament, which should be the subject of an investigation. All this undermining will accelerate if and when there is another general election, and thus needs urgent attention. She should be deselected for her anti Labour positioning and in my mind disloyalty to the leadership.